In this space, I have chronicled St. Luke’s journey toward becoming an integrated delivery system, an accountable care organization and a national quality and safety leader. I have featured patients and their perspectives, leaders, physicians and the innovative programs they have created. St. Luke’s success is due to the St. Luke’s team. We are known for great care, but also great caring. That caring comes from understanding that serving others is not just a job, but a personal mission and often, a calling. I have watched and learned from nurses for 40 years. I am convinced that there is a special place in Heaven for nurses. It is a demanding job, a high-pressure job, and one that is associated with extreme highs and lows. And no one can describe it as well as a nurse. Here is a very special piece of writing by Kristin Dewey, a St. Luke’s pediatric nurse. It will make you want to give special thanks to all these outstanding health care professionals for their commitment, dedication, care and caring. I know it did for me. I still remember walking across the stage at my pinning ceremony in 2006. I was 21 years old, bright eyed, motivated and ready to change the world. I’d read of Florence Nightingale and of her nursing theories. I’d studied the human body, pathophysiology, pharmacology, chemistry, you name it. I’ll be honest. The sole reason I became a nurse was because I wanted to take care of people. The medicine was always secondary. The primary draw was the opportunity to serve and care for others in their most vulnerable and frail moments, and I viewed medicine as the way to do so. The one thing I had not mastered in school was the thing no one talks about: how to navigate the pain. Not the pain of my patients – I learned how to alleviate that pain. What I am talking about is the pain in a nurse’s heart, in the places that are scary and that hurt me deep inside my soul. The pain of seeing unfathomable grief and tragedy, not just once or twice, but hundreds of times. Did anyone warn me how many times my heart would break from being a nurse? That I might experience my own grief? And if someone would have told me back then that it would actually be beautiful, I would have called them crazy. It took me two years to find my calling in nursing. It came when I applied for a job on a pediatric unit in 2008. Infants through teens have since been my specialty. These patients are awesome — resilient, inspiring and brave beyond measure. But let's talk about parents. I’ve seen some devoted and loving parents through the years. I’ve seen endless numbers of parents that display love like I’ve never known. I’ve also seen others. I’ll leave it at that. Regardless, it’s pretty remarkable how in a matter of seconds I can go from being a complete stranger to being one of the most important people in these families’ lives because I am entrusted with the life of their child. I walk into a patient room and immediately, it is my job to do everything in my power to advocate and to be an instrument of quality and safe patient care. For kids who don’t have a voice, I am their voice. I am the eyes of the doctor for the hours during which I work at the bedside, watching monitors and vital signs and making sure these kids stay alive. I am the ears, listening to every move my patient’s body makes. I don’t miss a beat, because it’s my job to pay attention. Most days go fairly well. I love nailing an IV and preventing harm to my patients. I love knowing exactly what to do when I need to intervene quickly. I dot my I’s and cross my T’s and love being a thorough nurse. I love seeing dark nights come to an end, when a child has slowly and steadily made steps toward, and eventually reached, recovery. I feel so happy that I was there to help. That I was part of a miracle. These are all the upsides of nursing. But what happens when medicine fails? What happens when there is nothing I can do, when all options are exhausted? When there is nothing anyone can do? Or when CPR and codes do not prevail? Some nurses shy away from pain. Some are afraid of the darkness. I have looked into the eyes of my patients, wondering what they are thinking, and families when it becomes clear that all the love in the world is now not enough. And I have asked God a hundred times why He allows such a deep and dark pain into these lives. I have asked God to heal these children and seen some that get healed and some that don’t, and wondered why. I have driven home far too many times sobbing, feeling empty inside. We all want the miracle. We all want the healing. We don’t want to feel pain, and we certainly don't want to experience loss. What happens if God does not grant the healing we seek? Does that change how I should respond as the nurse? Never. In fact, this is when my soul is beckoned to dig deeper. To find strength and composure within that allows me to be a beam of hope and light in the darkness. To give love, care, hugs, meds, fuzzy blankets, stuffed animals, calm music playing in the background, and to watch a child be ushered into Heaven, because this is my calling. To give a mother and father permission to lay in bed with their child and to not be afraid of the cords, tubes and monitors because every last cuddle counts. To give myself permission to cry a little if it hurts, because their child is not just another patient to me, but is special and precious. So maybe this is the beauty of nursing. It might break your heart, but it will be beautiful. It will be sacred. If you dare to journey into the darkness with your patients and their families, you will indeed be blessed. In these moments, I know that I am standing on holy ground, and I was not assigned these patients by mistake. These kids change me forever. I have them all in my heart. In a matter of hours, I can become bonded forever with their parents. I might run into the parents out in public one day, and I will hug them and cry because I was there on the worst night of their lives, or their best. Yes, it was me. Their nurse. 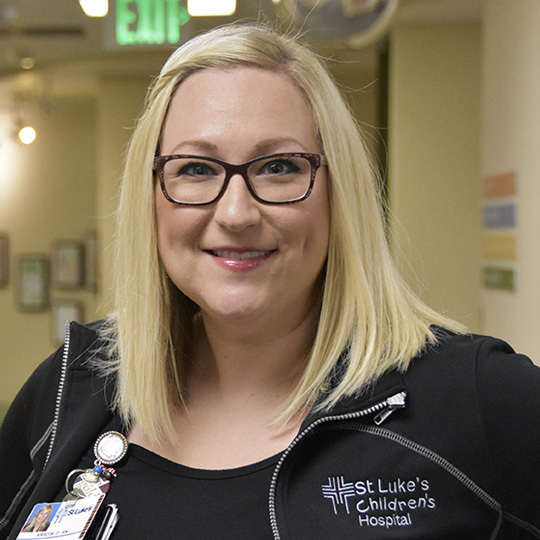 Kristin Dewey is a pediatric nurse at St. Luke's Children's Hospital, based in Boise, Idaho.